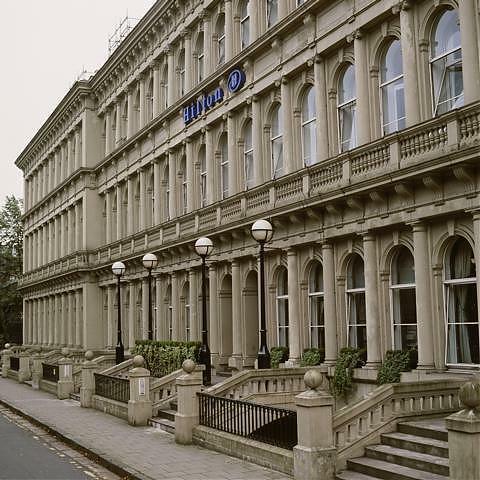 Occupying an excellent location in Glasgow’s West End, the Hilton Glasgow Grosvenor hotel allows you to make the most of your time in the city. Stay connected with WiFi at the convenient in-room work desk. Your room at the Hilton Glasgow Grosvenor hotel allows you to relax in style. Watch a film on the flat screen television, listen to your favorite song when you connect your MP3 player to the alarm clock or luxuriate in your large marble bathroom. For those guests requiring a little extra space the Deluxe Rooms and the Suites offered by the hotel are the perfect solution. The hotel is home to a variety of dining choices: enjoy fine locally sourced cuisine in the Bo’Vine Steak Restaurant or head to bobar, a unique popular local bar that serves drinks and food in a relaxed, stylish setting. The hotel’s flexible function rooms make it the perfect venue for your business meeting, graduation ball or wedding. You can unwind at our sister hotel, the Hilton Glasgow hotel, with complimentary access to their indoor swimming pool and fully-equipped fitness center.